i'm with you bill+greg with the cheezie late night women horror flicks i know this might sound nuts but i am going to get the last 3 for easter i think my teenagers will love them and i know i will. great theme. The team at the planet macabre podcast are outright hilarious and make horror movies so entertaining where you want to run out and rent or buy the movies right away. Episode 9 the latest Easter movies is incrdible I was literally laughing out of my skin in certain sections. Along with each host's segment, 5 reviews and news is a totally rounded show that makes we wish this was a daily show. I can't wait for this bonus episode & thanks for giving us fans craving for more. Thanks so much for stopping by, and for the great comments. @M.Fry: Yeah, most people don't know about this earlier version of the film (which might also be because, after nearly 30 years, the 1982 version is approaching the "classic" label now as well). It's definitely worth a watch, and please let me know what you think of the movie when you get the chance to see it. @Hound Dog Dale: Thanks so much for the kind words. We really do appreciate them. And Billchete definitely has something neat (and very new) lined up for Planet Macabre's "Bonus" show, so you won't want to miss it! Thanks to everyone for stopping by, and for listening to Planet Macabre. @L.L. Jorgins: Thanks so much for the kind words and for stopping by. I will say that, if you're looking for a laugh, PETER ROTTENTAIL and KOTTENTAIL won't disappoint. But if it's quality you want, then avoid them! But oh well I'm glad. @Pat: Thanks so much for stopping by, and for the very entertaining comment! You definitely win the prize for most creative! I'll be checking out your blog regularly now as well. 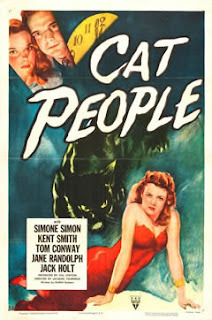 Grade "A" episode and I look forward to watching Cat People. One thing I like about your segment, most of these picks are in "Public Domain" and are free to view online! Another fine classic Doctor. I ♥ Planet Macabre. Love this movie. There's a particular vibe to films that Val Lewton produced--they're easy to pick out. If you haven't already seen it, I suggest looking for I Walked With a Zombie, another Lewton classic that is arguably better than Cat People. @Kris: I'm glad you like the pick, and I'm also happy you have a chance to see it for free! Please let me know what you think of the film when you get a chance to see it. Thanks for listening. @Anonymous: Thanks for the kind words. They are appreciated. And thanks also for listening. @Movie Guy Steve: Yeah, Lewton's films definitely have a specific feel about them. I was able to catch I WALKED WITH A ZOMBIE, and it's a terrific film. For me, it's just behind CAT PEOPLE as Lewton's best movie. @Max: Thanks so much. I'm glad you liked the show. And thanks for listening. your finding alot of diamounds in the rough on the chills of yy. geez i thought i knew old horror but many of your selections are new to me. thanks alot this was a great movie i watched it last night. @Buck005: Thanks so much for stopping by. I'm glad you're enjoying the Chills of Yesteryear picks, and that you liked CAT PEOPLE. Hearing this from listeners is always gratifying. BTW, if you have any favorite old-time horror films, please pass them along. I'm always looking for movies to include in the segment! Hilarious show this 1,I have a questien on night of the Lepus,what does Lepus mean.Cat People sounds really good. @Vardine Thanks so much for stopping by. I'm glad you enjoyed the show. As for Lepus, while I don't know the exact definition, I believe it's a classification (Genus, maybe) of a type of rabbit. As for Cat People, definitely check it out. It's a good one! Hey MON, Hey MON, more impersonations with Lady Phantom, loved it Doc Shock. All the hosts were particularly hilarious on this episode. Some great DVD's this week also, Cat People, Drag Me To Hell & Primal has been bought. Waiting on the shipment, should have it by the end of the week. I'm glad you enjoyed the episode, and I agree; some great movies recommended in this one. I liked DRAG ME TO HELL quite a bit, and I myself have yet to see PRIMAL, but I'm looking forward to it. Good horror pick this week; looking forward to this "bonus" episode coming soon, any little teasers you can spit out about it shock? @Xavier: Thanks for stopping by. I'm glad you liked the pick. As for the bonus episode, I'm sworn to secrecy (except to say it's not going to be like our normal format, and will feature several guests). Thanks for the comment, and for listening to Planet Macabre. We truly appreciate your support. Sweet horror movie Sir Dock, your doing well on Yeaster Year , no Duds so far. Thanks, also for the kind words. I'm glad you've enjoyed the films thus far, and here's hoping I can keep the streak alive! I got around to seeing Cat People and it was good, & I found it for $1.78 New! I'm glad you enjoyed the film (and that is an incredible price!). No need to thank me...it was my pleasure! Easter horror how KOOLIO is that. Exciting show. @jkKOOLIO: Thanks for stopping by, and I'm glad you enjoyed the show. Thanks also for listening to Planet Macabre.